Kozarnika – traces of the first humans in Europe? The Neanderthals commonly called by scholars “the first modern men” are already relatively well studied by historians and archaeologists. From the pieces of skulls found and dated about 35 to 40,000 years ago even sculptures were created showing how did the “first Europeans” looked like. It is for certain that they did not belong to any of the different races that have gradually formed till nowadays, but they were rather a mixture between the representatives of the white, yellow and black race. Some scientists reached even further in their summaries: “Dressed in a suit, these guys wouldn’t look out of place in any of our contemporary cities.” There are many disputes as to where did the first Neanderthals settled when they came in Europe from Africa. Several archaeological excavations claim to have found their first settlements, such as near the Don River, in a cave in northern Greece, which is in fact visited by many Bulgarian tourists, in Spain, in Turkey and so on. With what success can Bulgaria intervene in this “hosting” dispute, and especially the KozarnikaCave near the village of Oreshets close to Belogradchik, where for years an international team of archaeologists study the traces found of life in the prehistoric times? As interesting and exciting these revelations are for the archaeologists regarding the late Palaeolithic culture from 37 to 34 century BC, they do not reveal any revolutionary new facts about the Neanderthals. But why does the cave raise such interest among the scientists? The secret lies in the lowest layers of the excavations, which are capable of reversing the concept of the ancient history and the first appearance of human beings. Because in these layers remains of human beings of age of 1.4 million years have been found! Scientists believe to have found evidence for the presence of Homo erectus – and if these suspicions are confirmed, this would be the oldest evidence of human presence in this part of the world and it would not only reverse the concept that prehistoric men first set their foot in Europe through the Strait of Gibraltar, but that this happened almost one million years ago. The bones discovered with sharp cuts on them caused quite fierce scientific debates, and some assert that these cuts were not the result of any chance, but they have been made deliberately by the forefathers of men. This hypothesis unlocked a strong opposition among the scientists who were demonstrating that the ability of symbolic thinking – i.e. the need of a man to mark the nature with signs – occurred somewhere before 50,000 years. An interesting fact is that the results of these archaeological studies are known today by reason of a happy coincidence. 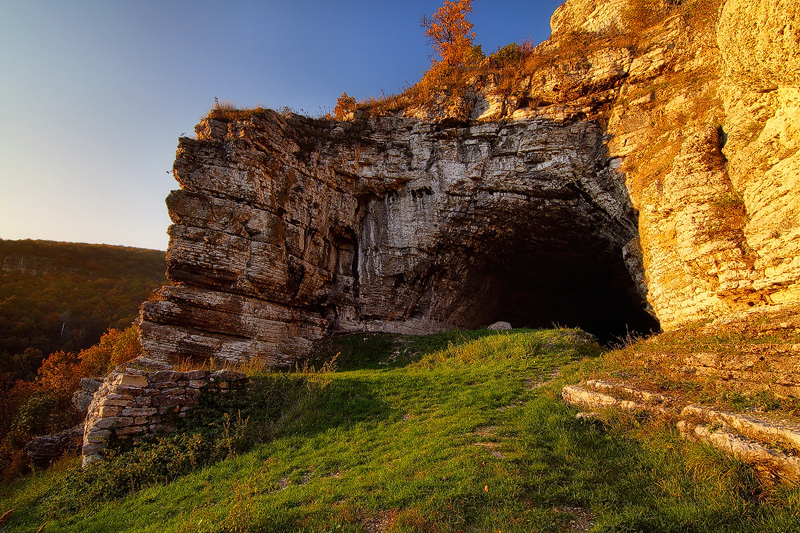 The KozarnikaCave and the other cave Mirizlivka opposite it have been envisaged for the development of business for many years ago, and according to locals – even for bomb shelters. It is said that there were ideas to turn the caves into bars, livestock enclosures, mushroom beds and etc. The most hideous of all legends is about a project according to which the caves could be used for storage of hazardous waste. Today archaeologists are progressing very slowly and have already studied an area of ​​about 7 square meters at 750 meters depth. The work advances at such a rate because virtually every handful of soil should be carefully searched for traces of human presence. As of 1996 archaeological excavations are organized in the cave by the Archaeological Institute of the Bulgarian Academy of Sciences, Sofia, the Institute of Geology and Quaternary Prehistory in Bordeaux and are led by Nikolay Sirakov and Jean-Luc Guadelli. A team of 20 Bulgarian and French archaeologists are trying to prove this theory, after 11 years of excavations in the Kozarnika Cave located in north-western Bulgaria. The traces of human activity found dating back 1.4 to 1.6 million years raise the issues of where did the first men actually live before they settled in different places and spreaded all over Europe. According to current theories, the first people came to Europe from South Africa across the Strait of Gibraltar before about 800,000 years. But according to Jean-Luc Guadelli – the Director of the team of archaeologists from the French National Centre for Scientific Research, since Bulgaria is located in Eastern Europe it was one of the most natural routes, where the prehistoric man could have passed on its way to Europe. Coming from Africa the first people could more easily have entered into the heart of Europe through the Bosphorus, then crossed the Danube at the Iron Gates gorge, located between Romania and Serbia, said Guadelli in an interview with AFP. ”It is very possible that this was probably the way our forefathers, driven by their natural curiosity and in search of a favourable climate and natural conditions to have come on the European continent”, confirmed Jean-Claude Leblanc, a professor at the University of Toulouse, coming from Bulgaria, and added: ” We must change our conceptual systems and methods in this matter”. The theory of the passage of prehistoric men through the Strait of Gibraltar was constructed and shaped by Western scholars, on the basis of the abundant archaeological finds discovered in Western Europe. But this information has come from only one part of the European continent, and afterwards these breakthroughs have been accepted as valid for the entire continent, which was not correct, noted a scientist from the BulgarianAcademy of Sciences (BAS). Nikolay Sirakov, who is also deputy head of the team of archaeologists in Kozarnika Cave and his French colleague Guadelli have been in contact for nearly 20 years before deciding to start excavations in the cave in 1996. The unique cave Kozarnika is located in rocky area near the famous north-western town of Belogradchik and is only accessible by foot or by off-road vehicles. In the last century the cave was considered and arena of human activity during the Stone Age. This place was recorded as early as 1920 in the writings of the famous Bulgarian archaeologist and researcher Rafail Popov. But the lack of resources to conduct thorough research and excavations is the reason for the lack of serious scientific discoveries. The carved and jagged pieces of bones found in the Kozarnika Cave led the scientists to conclude that the first inhabitants of the cave were able to express abstract ideas through sculptures and for the purpose of counting they have used the most common method of notches. The animal bones with parallel lines carved on them indicate that the first people were counting the days. The research of these lines indicated that they were made during the Stone Age. The sharp notches were too precise to be considered accidentally made on bone by removing the flesh of the animal from the bone, said the specialists. Despite the discoveries made, scientists still disagree about how old people were expressing abstract concepts. Unlike other caves in Western Europe, where there are cave paintings considered as symbolic expression of thoughts and events, no such cave paintings have been found in the Kozarnika Cave. But their absence does not question the ability of our ancestors to think abstractly, said Jean-Luc Guadelli. The cave paintings from the period of the Stone Age found in Bulgaria, as general are not much, but this can not lead to the conclusion that the ancient people in these lands simply did not have artistic inclinations, jokes the French scientist.